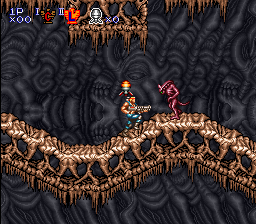 SNES Contra III: The Alien Wars (USA) "game end glitch" in 03:32.13 by Dark Cloud. Here we have another game completely demolished by abuse of game breaking glitches. The author initiates a glitch involving the character dying and gaining a 1-up during the fadeout to a Game Over screen. This allows him to skip many levels and complete the game in just 3 and half minutes! For fast completion that does not use this glitch there is the 2-player version.